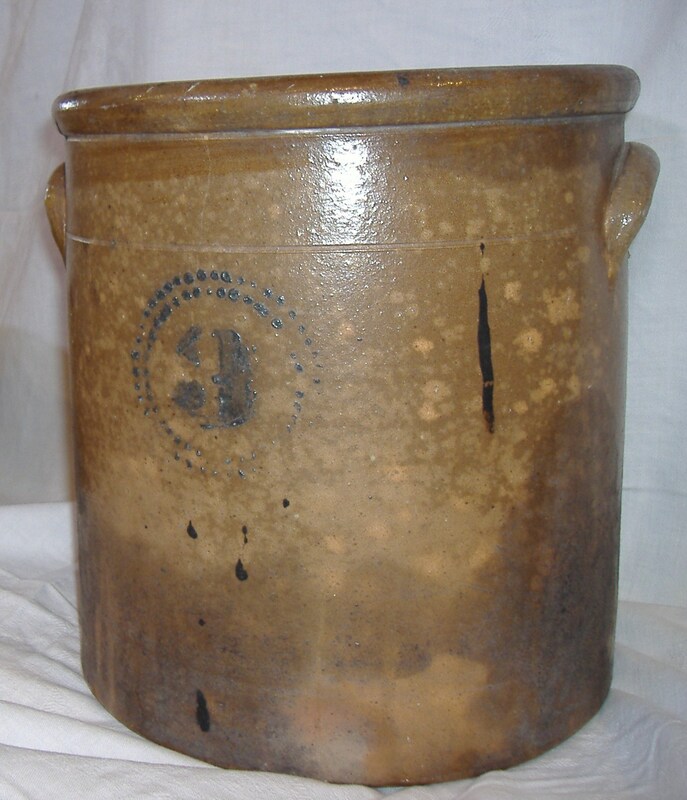 The three gallon crock here photographed has a golden amber glaze. The capacity "3" (gallons) surrounded by an organic wreath is stamped with cobalt blue glaze. The crock was recovered from the far corner of an attic in a building on Maple Street, Bonneauville. The building was constructed by Jacob Miller after the Civil War. Bird whitewash and mouse nests indicated that the piece sat many decades in the same position. The attic was in such poor condition that it freely allowed the comings and goings of avian intruders. The crock marked "1 1/2 " (gallons) belongs to Mr. and Mrs. Roy Lehto of Bonneauville. It had been owned by Louise Myers Orndorff of 21 E. Hanover Street, Bonneauville. Her parents, Ambrose and Bertha Myers of 3 Cedar Street owned the crock before her and Mr. and Mrs. Cletus Myers of the same address in Bonneauville owned it before Ambrose and Bertha. The piece was in the same family in Bonneauville for a long period. Both pieces appear to be of the same maker. Both have probably been in Bonneauville for a century or more. The possibility exists that the origin of these pieces is the Ditzler kiln that operated in the town (now West Hanover St.) during the mid 19th Century. The famed potter Anthony Baecher was one of the employees of that business. Of course other possibilities as to the origin of the two crocks exist. 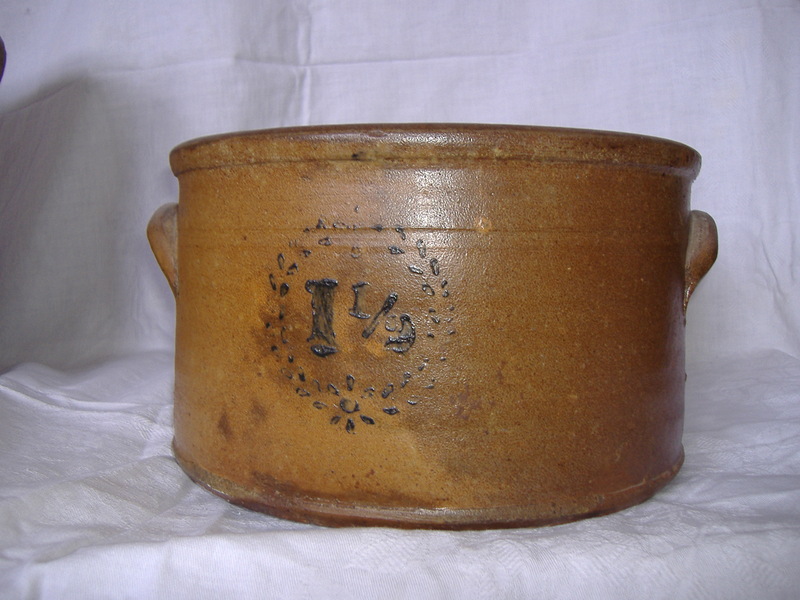 There were several general stores in the town in the past two hundred years that sold this type of wares. Acquired from: Patricia (Pat Staub) and Jerry Staub.